I think my favorite souvenir I bring home from all of our adventures, but especially from Disneyland, are our photos. I love seeing pictures of those special moments on my wall, in my timehop or facebook memories, and even just looking through them on my phone with my family. A lot of people think there is no way that they can get amazing Disneyland photos from their vacation without paying a professional photographer. 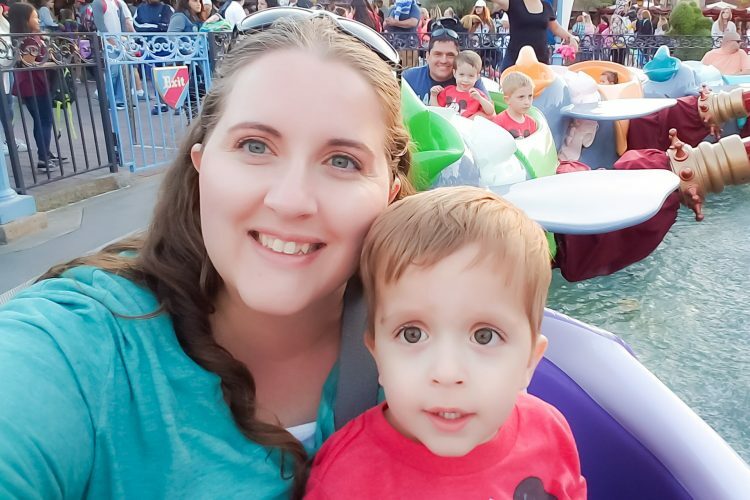 Others think that they will rely on photopass, only to be disappointed that there may not be a photopass photographer there to capture those special moments right when they happen. 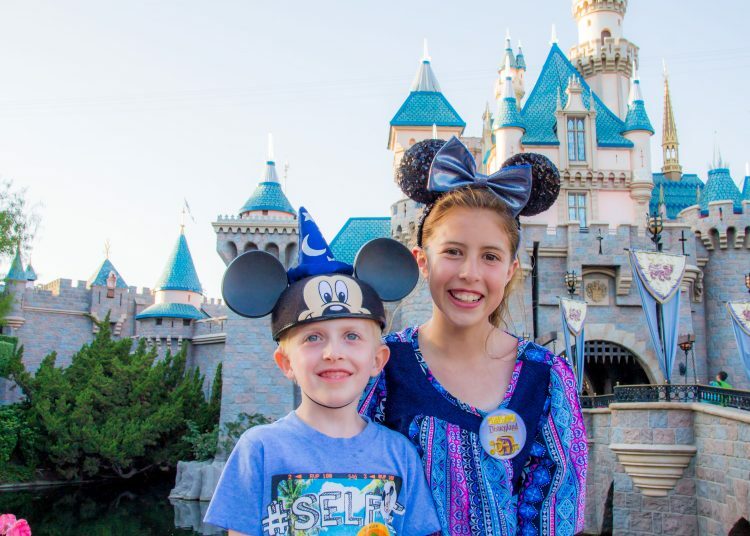 And others may have children like mine where getting everyone to look at the camera, or even sit still, is nearly impossible.So today I am going to share some tips on how to take some amazing Disneyland Photos. Best thing, these are tips that do not require you enrolling in a photography course or purchasing an expensive camera. How many times have you been on vacation, trying to get that perfect shot and have it turn out like this? Why can’t they sit still, look at me and smile? This photo I had this awesome photo in my head. 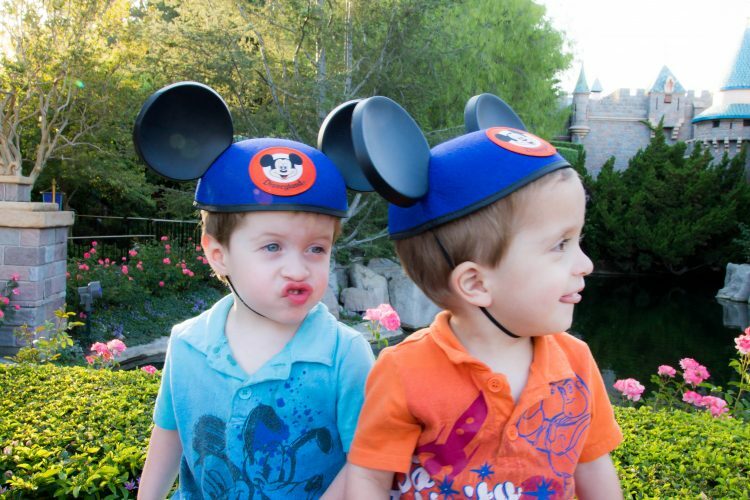 The cute twin picture, with the castle in the background, them looking at me with their Mickey Mouse Ears on. Yeah…..they had other ideas. One twin would not sit still and the other wouldn’t look at me. But that was just the beginning of the issues with this photo. 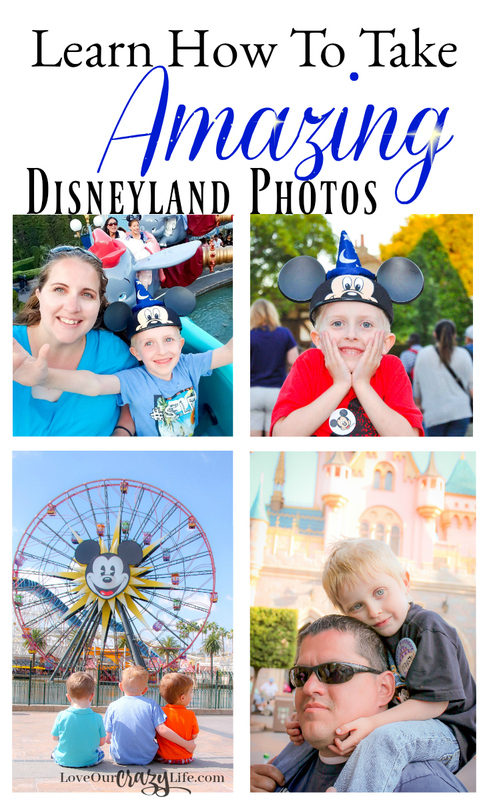 Today I am going to share with you some tips to get those amazing Disneyland photos that you want to cherish. And these tips are not going to be telling you to purchase fancy equipment or fancy editing techniques. These are going to be real life tips that you can do whether you are using your phone or a DSLR camera. So be sure to check this post out! You can’t just buy or rent an expensive DSLR camera days before your trip, and expect to go in to the park and take amazing photos. Sorry, it doesn’t work like that. Unless you get extremely lucky or have photography experience. It takes a little forethought to be able to get these amazing photos. 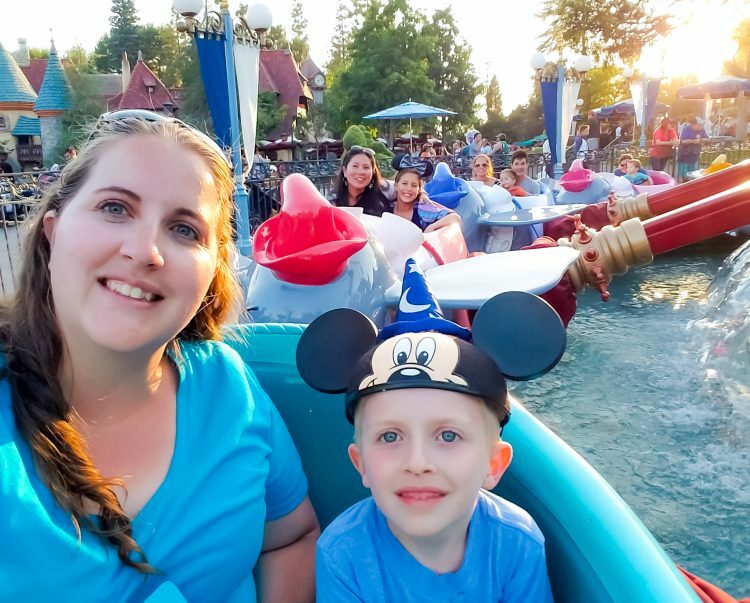 Here are some things you should be doing BEFORE your Disneyland vacation to get amazing Disneyland photos while you are in the park. 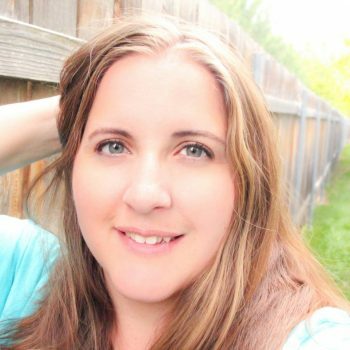 Yes, learning your camera may even mean practicing your selfie skills. Search for inspiration. Sometimes it is hard to figure out exactly what we want to get pictures of. 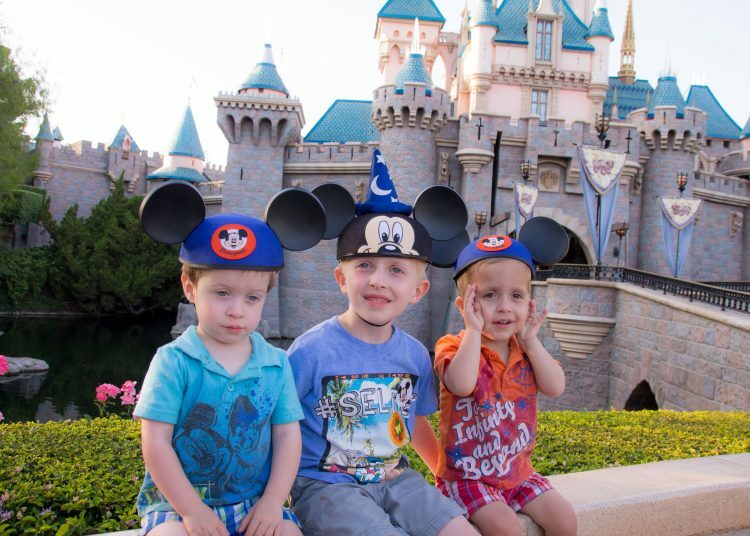 The picture at the top of this post of my three boys, I never would have thought to do that until I was in a Disney Photography group and saw a similar picture taken (from a different angle and slightly different location) that someone posted of their kids. That inspired me. 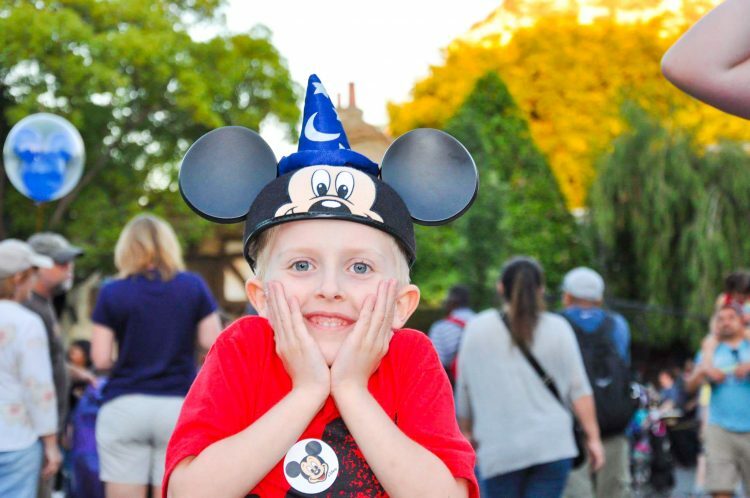 So get online and search your favorite Disney blogs and instagram accounts for some ideas. Plan your shots ahead. Plan ahead some of the shots you want to get. That includes thinking about what outfits you want in the shot. 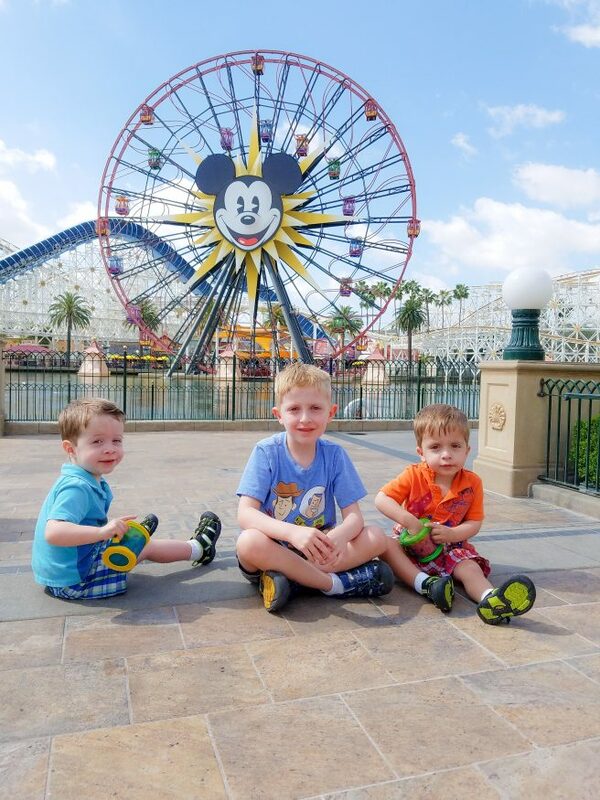 Once again, when I took that picture of my three boys on Paradise Pier, I put careful thought into what outfits I wanted them to wear that day. It wasn’t so much about the specific outfit, but making sure the colors would compliment each other and the surrounding environment. If you have never been to Disney, again, seek out inspiration. Check out those photos you love and see what they wore and what colors you might have around you. Also, plan out any special locations you want to photograph and when the best times to photograph in those places are. There are a lot of issues with this photo. Poor lighting, the noise (this was taken with an older phone…man have they come a long way) but those things I could probably somewhat fix in editing without a lot of time. But what I can’t fix without a lot of work…the crowds behind me. Crowds are a natural part of a Disney vacation. You can’t just magically make them disappear right? Or can you? Here are some tips for taking pictures in crowds. Find an out of the way spot. See how in the picture above we were perfectly centered in front of the castle? That is what everyone thinks of when they think of getting that castle shot. However, in Disneyland, there are paths that go to the side of each castle, plus benches around the front. Step over to those areas and see the crowds in the back of your photo magically disappear (or at least lessen by a great amount). This photo was taken off to the side of the castle. Notice the crowds are gone. Know the crowd flow. Knowing the crowd flow will help you know when you can expect more crowds and when an area might be less busy. 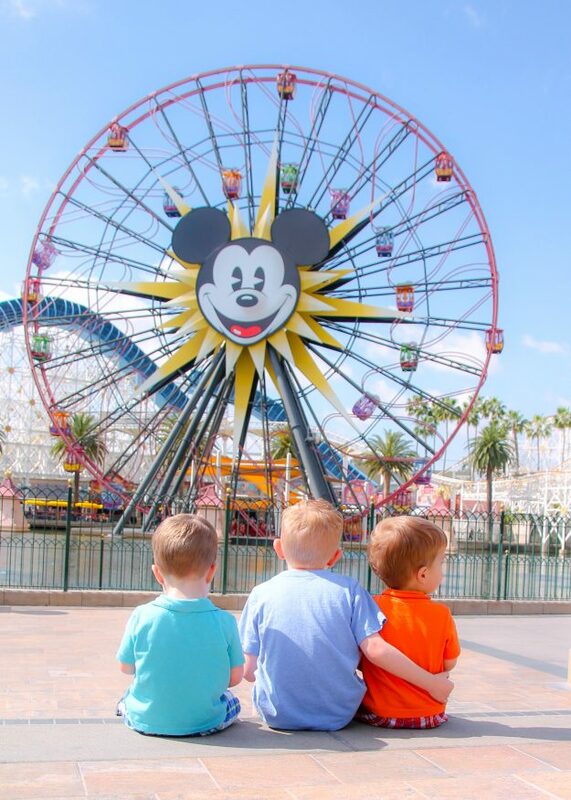 Want the shot I have of my three boys on Paradise Pier- head over there in the morning before the sun gets too high. Want a shot in front of the castle with less crowds, go close to sunset or around parade time when less people are going through the drawbridge entrance (or it may even be blocked off if you are lucky). A great way to learn crowd flow in areas of the park is to watch the Disneyland Parks App and the ride wait times. While it isn’t a perfect indicator, it can give you a clue to how busy certain areas are. Depth of field. I promised this post would not include tips that would require advance skills. So I won’t get into the manual settings on a DSLR where you can adjust the depth of field, etc. Instead I will say just to learn a little about depth of field and how to help control it even in auto settings. Sometimes the perfect shot happens in the middle of a crowd. You can’t help that. But if you can make it so the crowd is out of focus, it can help make the picture amazing, despite the crowd. 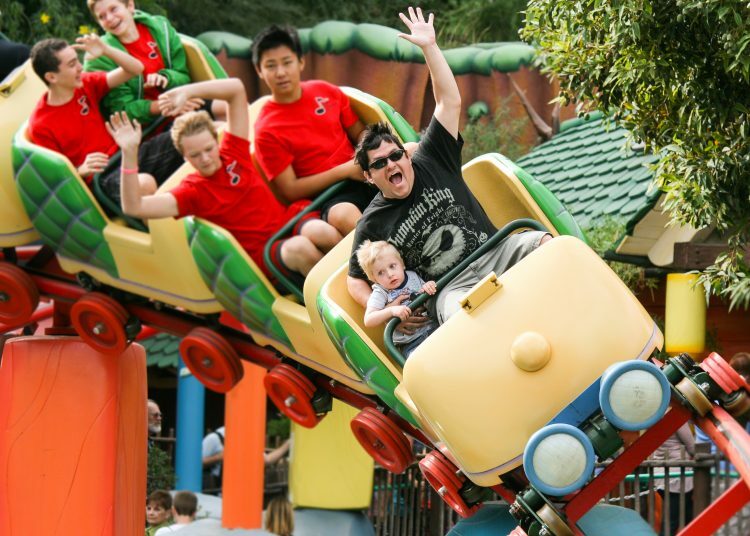 Check out this picture my friend Michaelyn from The Mousekatools Mom caught of the Goof on our last trip to Disneyland. This was a spontaneous moment in the middle of the crowds, but the photo is still frame worthy. So, why are the crowds in this photo less annoying than the crowds in the castle photo I posted earlier? Because they aren’t in focus. Depth of field. Now, Michaelyn caught this in auto mode (if I remember correctly) but even in auto, you can help control the depth of field. How? By choosing a point of focus. On a phone this usually means tapping the spot you want to be in focus. On a DSLR camera, when you take the picture, push your shutter button half way down (not enough to take a picture). Make sure the only focus points highlighted are of your subject and not the crowd behind the subject. If they aren’t, lift your finger and try to refocus. This is a skill that is good to practice at home before your trip as well. Minimizing crowds or at least the focus on crowds can help take your pictures to the next level. From scrapbook to framed on the wall. But that is not the only way to help get those amazing photos you will love. In general, Disney does a pretty good job on making sure the characters are situated in a spot to minimize crowds. I love that. 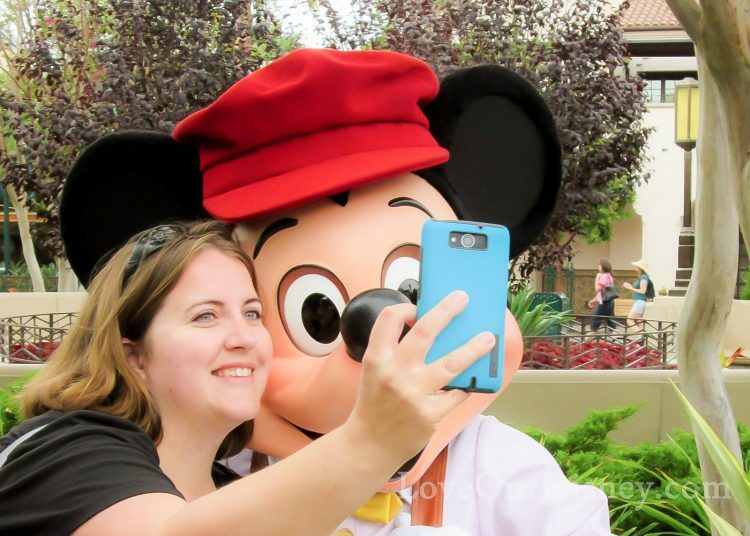 But there are some other things you should try and control to help get those amazing Disneyland photos when meeting your favorite characters. The lighting. Oh the lighting. The lighting of your photos with characters is going to make a huge difference. In general, try to be in a completely shaded area or out of direct sunlight. 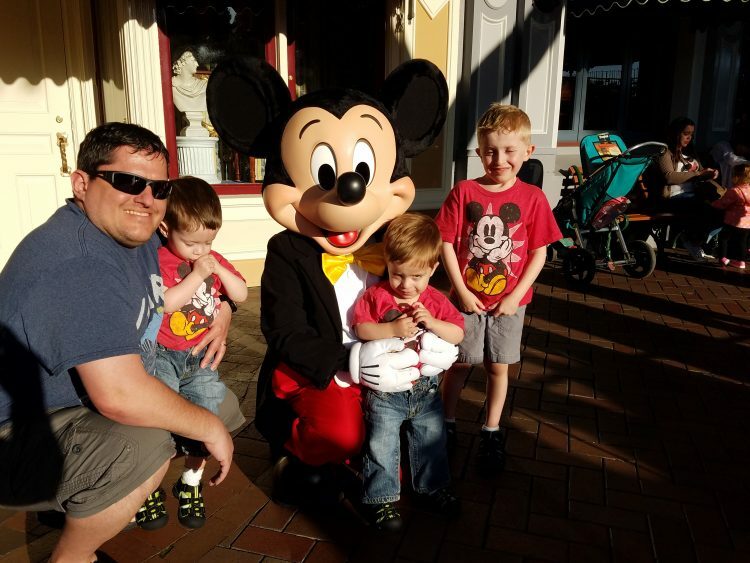 Really try to avoid taking photos with a character where they have you looking into the sun….oh Mickey! I didn’t even bother making sure everyone was looking because that sun was so bright and it created awful shadows, not just from my subjects, but from those waiting in line to get pictures and from Mickey’s nose and other features. When you can somewhat control the lighting it can make a huge difference. Get everyone level with the characters. If possible, try to get everyone close to the same height. Having characters kneel down when possible or picking small children up to their height. It can make a huge difference in the outcome of the photo. Check out the two photos below to see the difference it makes. First the one where the Goof is nowhere near the same height as the character. The Goof was much smaller than Daisy who could not bend down, and he looks like an after thought in the photo. Now the one where the Goof and the character are close to the same level. See how you can tell they are both the focus of the shot now? 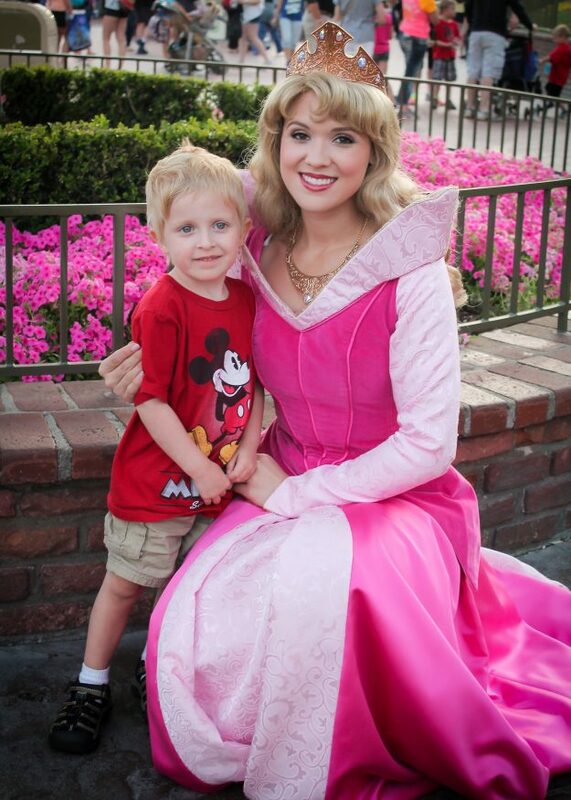 Princess Aurora knelt down so she was closer to the Goof’s height. Now they are both the focus of the picture. Don’t stress about kids looking at the camera. 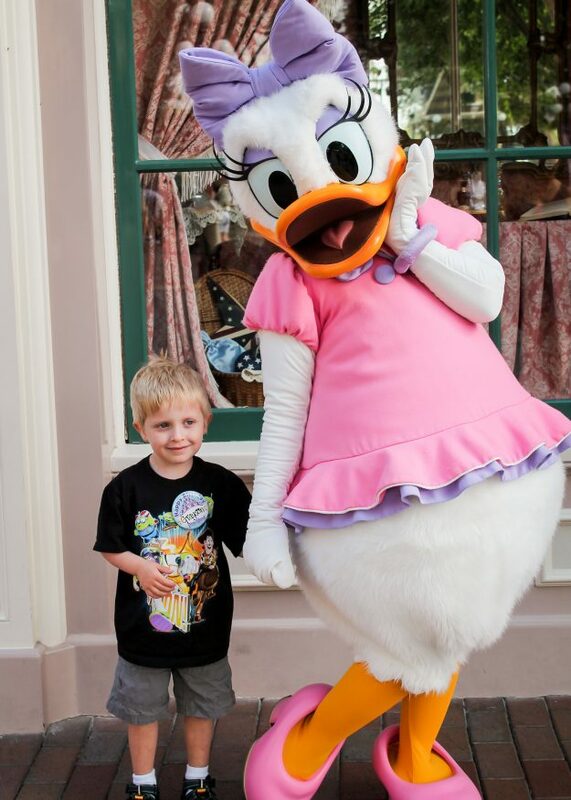 Kids get super excited to meet their favorite characters. Or they get terrified of them. It is important to adapt. 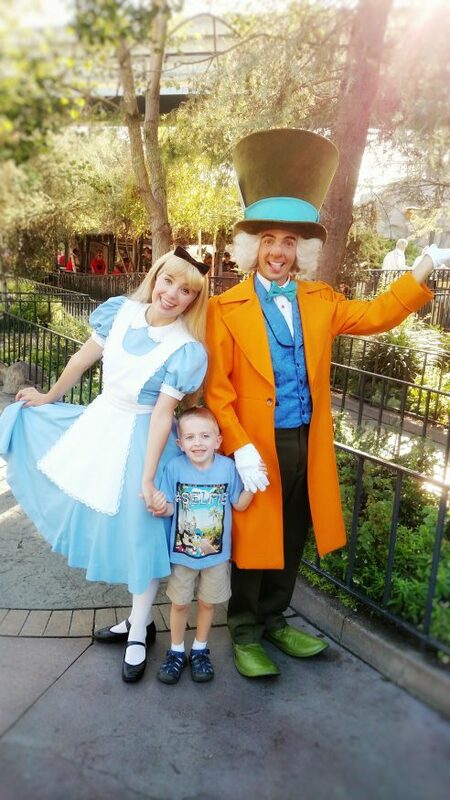 Maybe that means holding your child on the outside of the photo because they are scared of the characters. Or maybe it means capturing the interaction when they run up to meet their hero. Either way, do not stress over getting the perfect photo, especially with young children, because it may not happen, but that doesn’t mean your photos won’t be amazing. 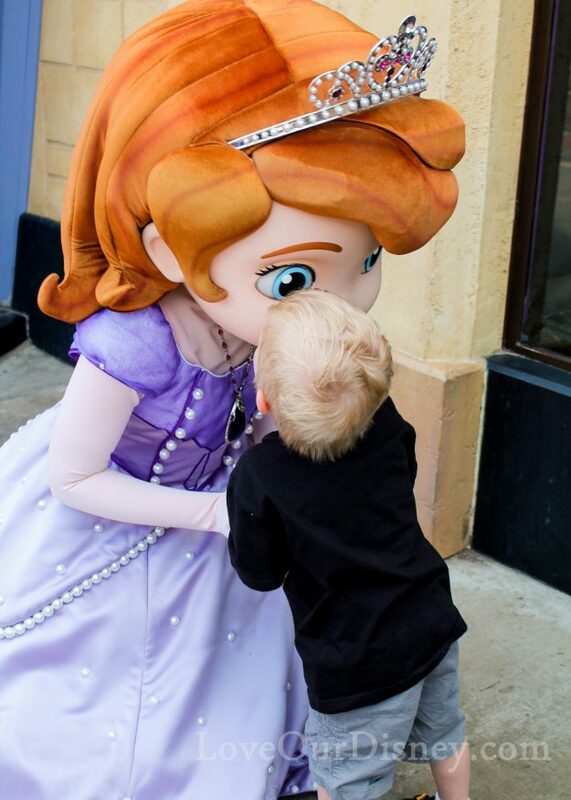 I couldn’t get the Goof to stop talking to and looking at Princess Sofia, but I cherish this photo of him giving her a kiss. Probably the hardest thing to do is get a good picture that captures the thrill of the rides, let alone amazing Disneyland photos that are frame worthy from the rides. Yes, Disneyland does have rides that take photos. These are fun, but honestly, usually include several people you do not know (unless you have a larger family) and are often taken while you are moving at high speeds, making the pictures low quality. But you can get some of the most amazing pictures on rides. So I am going to give you my tips for photographing ride moments. Practice taking selfies. Holding the camera up and out gave a unique angle to this photo which adds to the end result. I also love this one, on the same ride from March. It was a way to get a picture of all of us. The person in the front elephant snaps a selfie style photo where you can also see the people in the elephants behind you. We did this again in March, with a much larger group. Here we took up 4 elephants, but it still worked, even though the people in the back are tiny! 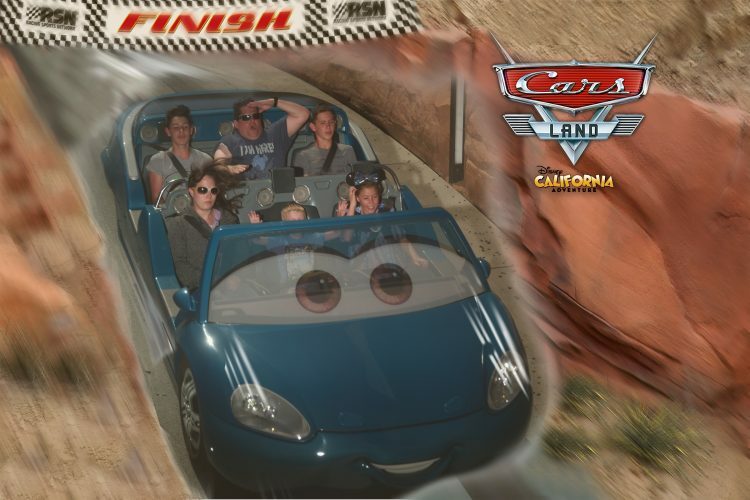 I don’t exactly like the shadows (the lighting was not as good) or how I have my head tilted, but I captured all of us on an iconic ride. We captured our large group in this shot by having the front vehicle take a picture. Use optical zoom and good positioning. I absolutely love that I was able to capture the Goof’s first time on a roller coaster. 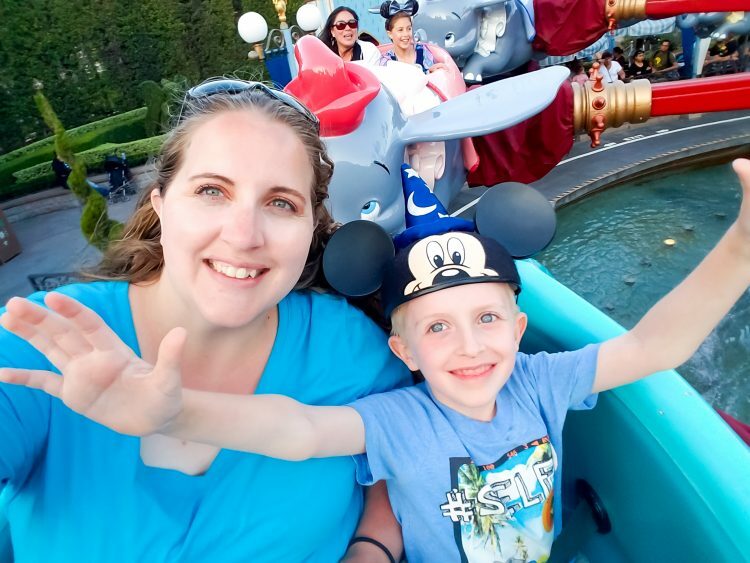 He had finally hit 35″ which meant he could ride Gadget’s Go Coaster in Mickey’s ToonTown. So, I had my husband and him request the front row. I then set up with my DSLR and zoom lens. I practiced taking photos while they waited in line so I knew when to take the shot. I mentioned a zoom lens. You could possibly do this with a point and shoot (though the shutter speed may be too slow) but I would not zoom in with a phone. If you want to know why, research Digital Zoom versus Optical Zoom. Phones use digital zoom, unless you purchase a clip on lens for them, but even then, they do not have the same capabilities as a larger camera lens. I was able to capture the Goof’s first roller coaster ride. He looks terrified but he asked to go again. This photo still makes me laugh and I can’t wait to get similar ones of the twins. How do you get that blurred background on the teacups? I think the picture that everyone always wants is the blurred background while spinning on the teacups. This is an amazing shot that I have not really attempted because all that spinning makes me woozy…I don’t dare look through a camera lens. But how is it done? Well, it goes back to the tip about depth of field as well as motion. BE sure that you are focused only on the person/people in your teacup and follow that person as they move. Also a longer shutter speed can help with this, but that is a little more advanced then I want to get for this tutorial (I promised you no advanced techniques). How do I get a unique feeling photo at a place that millions visit? One thing that makes amazing Disneyland photos is having one that everyone says “wow, I have never seen that before!” So how do you do that in a place that millions of people visit (and photograph) every single year. New perspective. This is probably the best way to get a unique feeling photograph in an overly photographed spot. Try taking a photo from a new point of view. I adore this photo that my friend’s teenage daughter took of her (the teen’s) little sister during our trip in June. It makes me think of the first look at the castle, and the excitement she must feel. It leaves you wondering what her expression on her face might be. It feels unique. I love this new perspective of a castle photo. Photo Credit: Maya B.
I love this shot I have of the Goof and my husband with the castle in the background. This feels unique because the angle is so different than the typical castle photo. This photo was actually taken while we were behind the castle, in the queue for Peter Pan. I looked over in line and saw the Goof resting his head on Mike’s and had to take a picture. It feels different than the typical castle picture since we were behind the castle. Remember, the people make it unique. Your pictures will be unique because it will be your loved ones in it. That said, to help keep the people you love as the focus, make sure that Disneyland is the backdrop, not the focus. 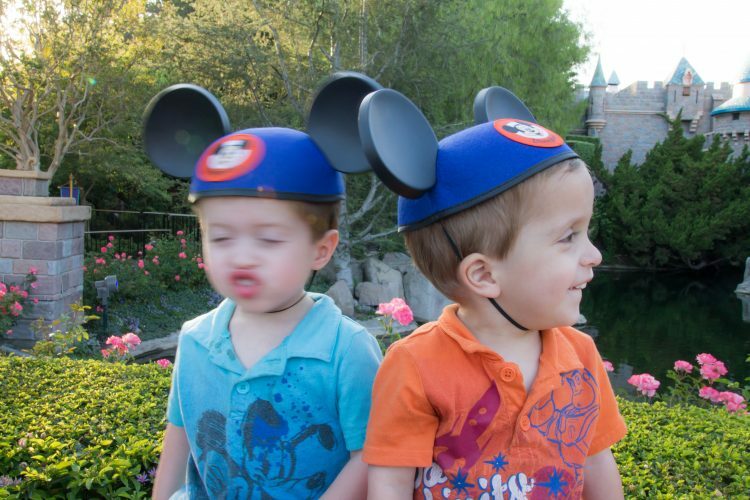 As an example, the picture of The Goof and Mike above- the castle is a backdrop, not the main focus. TIP: If you want to fit the whole castle (or other large landmark in) but keep your loved ones the main focus, have them stand farther away from the the castle or landmark. It makes them the main focus but you can still see the entire castle. That’s all good but, have you tried to photograph my kid? No, but I have tried to photograph mine. And trust me, they are hard to get a good shot of. Remember that first photo I shared of the twins? So all of the tips above can still leave you with children who can’t sit still or refuse to look at the camera. 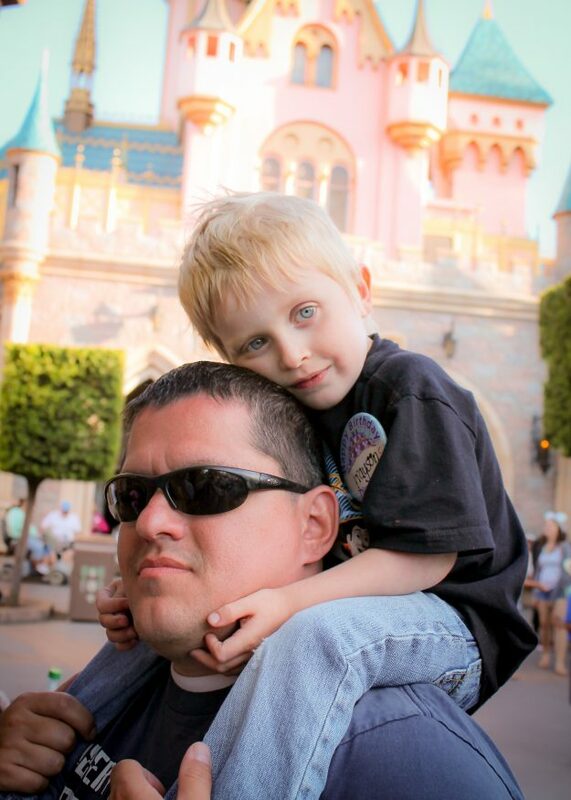 So let’s get some tips to still get amazing Disneyland photos with kids that aren’t professional models. Sneaky, sneaky. How did I get them to sit still and not fight? Getting kids to sit still. See this picture above. Very similar to the one at the beginning of the post, just this one was taken with my camera, not my phone. I took about 10 minutes to take lots of these photos using multiple cameras and my phone (you know, because I wanted one for instagram, some for blog posts, etc). So how did I get 3 brothers to sit together at Disneyland, without fighting or crying or running off? Those kids were actually eating snacks while I was photographing them. As a sidenote: Remember when I talked about having your main subject stand (or sit) farther away from your landmark so they are bigger. I have my boys sitting on the middle platform, and the top step. If you look closely at the fence, you can see there is a second fence past that which is lower. If I had them on that lowest level, they would have looked even tinier compared to Mickey’s Fun Wheel. Sometimes with kids you just have to take what you can get. Oh kids…why can’t you just give me that one amazing picture? Yep, one that still wouldn’t look at me, another was playing peek-a-boo and all three were kind of over it. 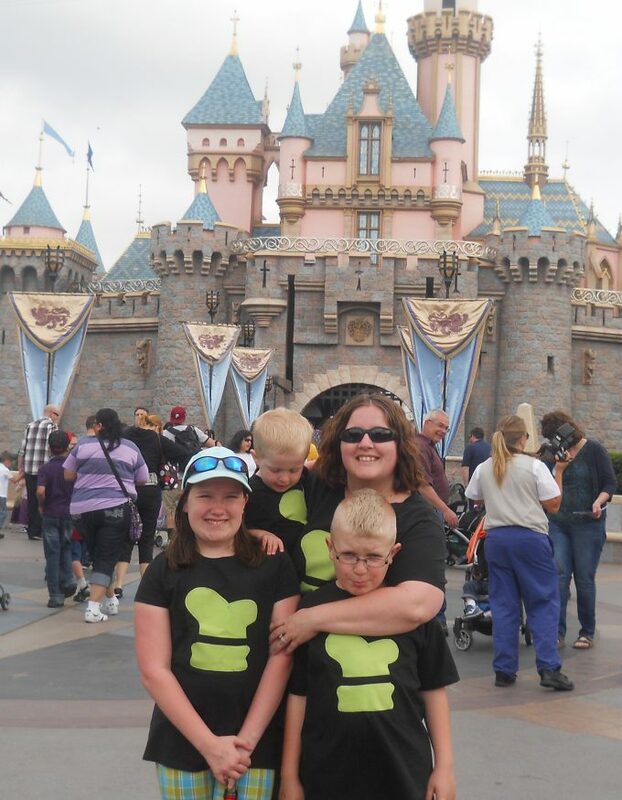 Probably because this was our 6th (yes sixth) day at Disneyland and they were kind of done with mom and her photos. But there was nobody at the castle drawbridge so I had to try. 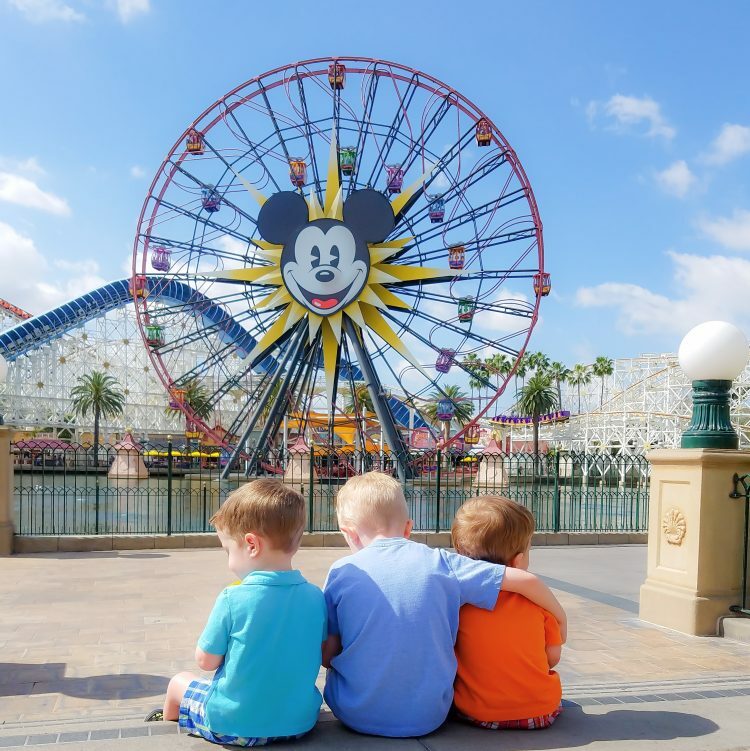 Sometimes you just have to take a million photos when you have little ones, and of those million you may get one that is an amazing Disneyland photo that you will cherish forever. 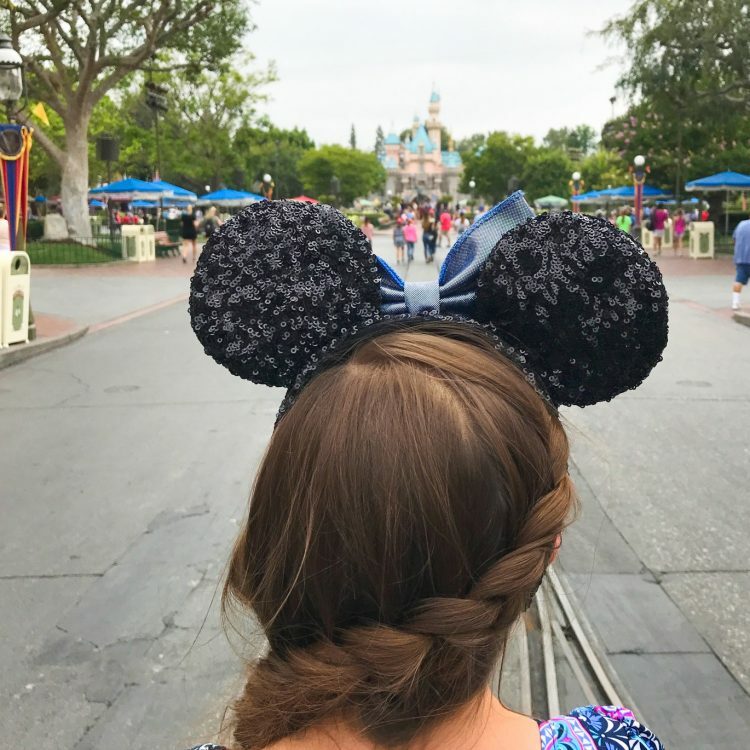 Hopefully these tips and photos have inspired you for your Disneyland vacation! Which of these tips has inspired you or taught you something new? Let me know in the comments. If you are wanting to go to Disneyland, we strongly suggest booking through our friends at Get Away Today. 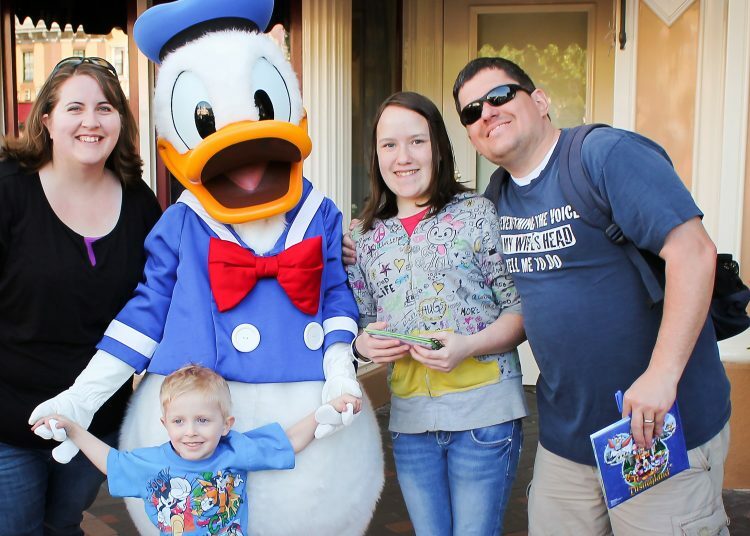 They can book your Disneyland package for as little as $175 down (with payment in full due 2 weeks before travel). Use our link Get Away Today and code CrazyAdventure to get $10 off qualifying packages. Becca, I love all of these! Your photos are amazing!